Through my work at the Including all Children and Families Project (http://includingallchildren.educ.ubc.ca/). I went on a few trips to rural communities in British Columbia together with Mary Stewart and Mari Pighini. 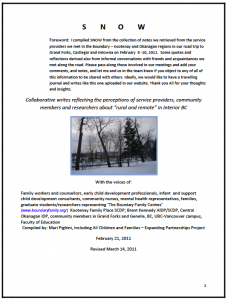 During a few of these trips Mary Stewart interviewed parents for her thesis on “Experiences of Parents in Rural and Remote British Columbia Who Have a Child with a Disability or Developmental Delay” (Case Studies). We also conducted focus groups with parents to discuss their experiences in accessing their child’s developmental information or records in early intervention or child development services (Linked Disc study). We met different service providers in the communities from the infant development program (IDP), physiotherapists, Family Place or Strong Start program staff and many more. These service providers helped us greatly in gaining trust with the parents, and also we held many conversations with them on how it is to provide services in these rural and remote communities. On a few occasions we stayed with people in their homes who hosted us with great generosity. I brought my camera to all these trips and took photos from the road, of the scenery around us, interesting sights, people and more. I tried to capture our adventures in these trips in this short video. Adriana Briseno, interview, Caro Rolando, editing (2012). Dana Brynelsen provides a history of the Infant Development Program of by Maya Goldstein (2012), shares her experiences with the program over 35 years while she served as their Provincial Advisor until this Office was closed in 2009, and adds her vision and insights around early intervention, child care, and supported child development in British Columbia. Caro Rolando, section editor for IFEX, is a graduate of Ryerson University’s Master of Journalism program and a freelance journalist. Caro’s most recent radio documentary, “One in Two Worlds,” explores the concepts of home, cultural identity and communication technology (carorolando.comt).